My challenge from Get It Scrapped! : Make a page inspired by the technique of collage. I decided to tackle my pile of photos of the presidential limousines on display at the Henry Ford Museum. They are my favorite display in the whole museum. One page would not be enough to do them justice. The title and journaling take up the first page of the two-page spread. The large stars were cut with my Silhouette and placed over vellum. This is not a pocket page! I just made it look like one. 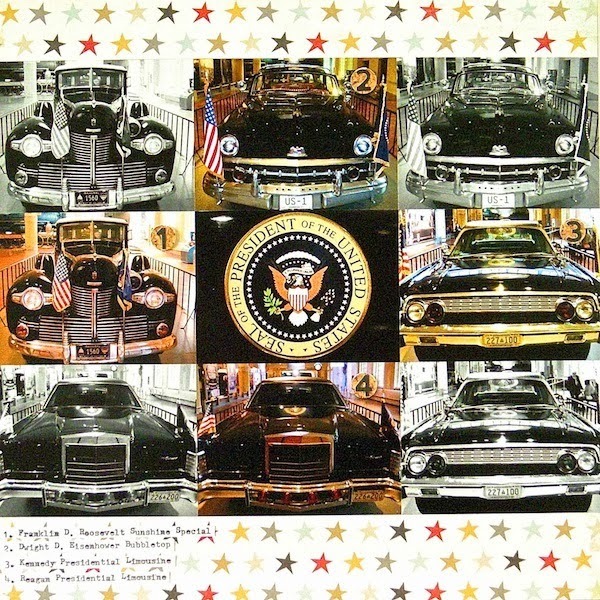 The collage of limos surrounds the presidential seal. Each car is photographed in color, then in black and white to evoke a sense of time and history. The entire two-page layout is united by a common color scheme, star motif and visual triangle of circle elements. You can see what the rest of the team did with this assignment in the full article. This is such a cool two-pager, Sue! I love the design with the mix of color and black and white photos! Awesome! Love the cut out stars. This is an amazing double pager, Sue!! 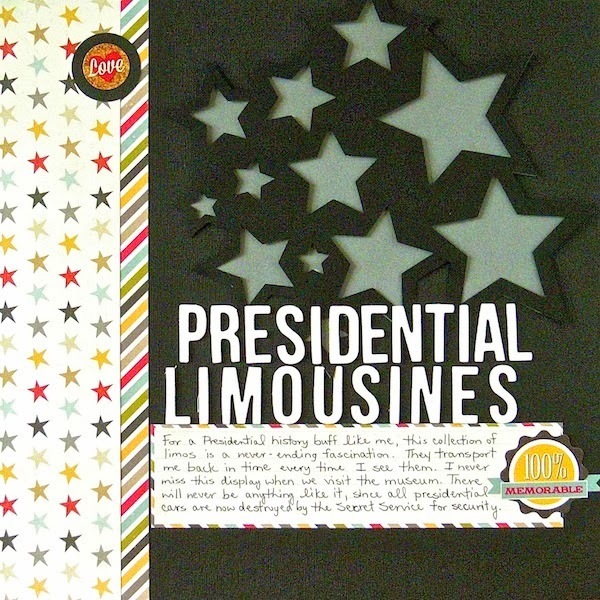 Love how you used the first page for your title and journaling and the die cut stars are awesome! !